Beat together cream cheese and a teaspoon of vanilla until fluffy. Stir in nuts and set aside. Cut bread into 10 to 12 1/2-inch slices. Cut a pocket in the top of each. Fill each with 1 1/2 tablespoons of cheese mixture. Beat together eggs, egg nog, 1/2 teaspoon vanilla, and nutmeg. Using tongs, carefully dip the filled bread slices in egg mixture; be careful not to squeeze out filling. Cook on both sides until golden brown. Meanwhile, cook apples and juice in a medium pan over medium/low heat until apples are tender. 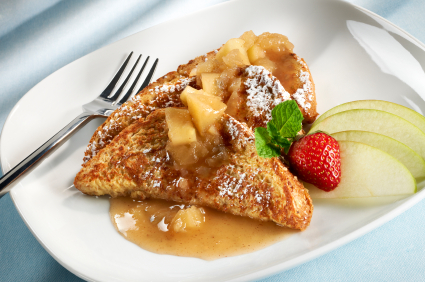 Place on hot French toast. Drizzle caramel sauce on top.